Left calls for elections over upheaval; at least one right-wing MK throws support behind Ya'alon despite history with Judea-Samaria. Several MKs were outraged at the resignation of former Defense Minister Moshe Ya'alon (Likud) from politics Friday, in a move taken before he was ousted from his ministerial post. Former Minister MK Benny Begin (Likud) expressed alarm in a special Arutz Sheva interview Friday, opining that Israel will "pay a high price" for the way the resignation came about. "Why did we need to expand the government?" he asked. "Naftali Bennett, Ayelet Shaked, and Uri Ariel are sitting in this right-wing government." "Do you think that Defense Minister Ya'alon did not want to build in Judea and Samaria? That such a decision is his personal opinion?" he added. "There's three Jewish Home ministers in the government and a construction freeze - and you think it's Ya'alon's fault?" Earlier, Deputy Defense Minister Rabbi Eli Ben-Dahan implied to Army Radio that, in fact, the freeze could have been Ya'alon's fault - as the latter refused to honor a coalition agreement wherein Jewish Home would be given control over the Civil Administration, the government body responsible for Judea-Samaria. Regardless, Begin believes the move was not worth expanding the government from 61 MKs to 66 or 67 - as MK Orly Levi-Abekasis resigned Thursday. "It's a miserable decision," he added. Many in the Likud mourned the decision. "The resignation today of Ya'alon is a great loss to the national camp in general and in particular to the Likud Party," Equality Minister MK Gila Gamliel (Likud) stated Friday. "For decades, since his days as an officer and commander of Sayeret Matkal and later as chief of staff, Ya'alon has contributed greatly to the country and we are all, without exception, obligated to him for it." "There is no doubt that if the way he was treated has been different, and not disrespectful, he would not have resigned today," she added. MK Sharren Haskel (Likud) agreed. "The resignation of Defense Minister Moshe Ya'alon and his retirement from political life is a loss for the Likud Party and the State of Israel as a whole," she said, calling Ya'alon "one of the most valuable people in the national camp." Ya'alon "knew the balance of actions needed for the security of Israeli citizens, and had a human and moral worldview established on the basis of Likud values," she added. "This was a Zionist national responsibility which he took upon himself." Immigration and Absorption Minister Ze'ev Elkin (Likud) expressed disappointment over the decision itself. "You don't enter the political world for one role," he stated to Army Radio. "You don't say, 'I'm going to be Defense Minister - and, if not, I'm leaving." One "senior Likud official" anonymously stated to Walla! News that the move could be dangerous for the party's future. "Ya'alon's resignation is a fatal blow to the movement which may mark its demise," the official opined. MK Erel Margalit (Zionist Union) called for elections. "Ya'alon was a brave man, who exposed the moral nakedness of (Binyamin) Netanyahu to the world," he said. "We must ignite the streets and bring elections now." "Who is next in line on the Likud list: Yehuda Glick," he added, referring to the Temple Mount prayer rights activist. "It's an appropriate substitution for this 'hilltop youth' government." "The Netanyahu era coming to an end, and in his party major powers are expressing no confidence in his leadership," MK Manuel Trachtenberg (Zionist Union) added. "I call again on outgoing Defense Minister Ya'alon and Minister of Finance Kahlon: build us a new political platform and sane - along with forces from the Knesset and outside it, and this is an opportunity for us to miss the opportunity." Zionist Union's Tzipi Livni defended Ya'alon. "I disagreed with the policy positions of Defense Minister Moshe Ya'alon - but I appreciated and [still] appreciate his ethical positions," she said. "The problem is that his values are not the government's." "The defense minister resigned, due to the lack of trust in the prime minister and the message is clear: the citizens of Israel cannot sleep peacefully at night anymore," MK Yoel Hasson (Zionist Union) added. "We have no one to trust and our fate is in the hands of a cynical and irresponsible prime minister." "[Ya'alon] joins a long chain of security experts who have expressed a lack of confidence in Netanyahu: Shin Bet chiefs, institution heads, Chiefs of Staff, and generals all say: Netanyahu is bad for security." "This is conclusive evidence of human moral damage the Prime Minister has caused to democracy and security," Meretz chairman Zehava Galon stated Friday. "With all the cynicism and cunning Netanyahu has, all this has made his defense minister the enemy, put only 5 seats in the coalition in exchange for a Defense Minister and major party player who despises you." MK Revital Swede added, "Welcome to the Dark Ages and the rule of dictatorship of the Netanyahu government." MK Nachman Shai (Zionist Union) hailed the move as a "courageous decision" which "removes the mask from the face of the right-wing extremist government." He further likened Ya'alon to an "abused child." MK Ofer Shelach (Yesh Atid) compared Ya'alon to a "circus clown." 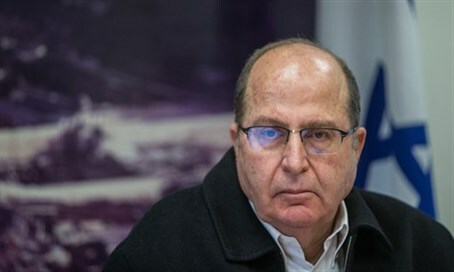 "Ya'alon is a decent man, and he did the decent thing: he refused to be a circus clown to Netanyahu anymore, and left him in disgust," Shelach said. "This is the time of the decent people to differentiate themselves from those who make politics a circus, and time of the public, which is paying the bill, to put a stop to those who hold dedication to the public in contempt." And MK Merav Michaeli (Zionist Union) called Ya'alon "another notch on Netanyahu's belt." "We lost a balanced and sane man, and the right-wing cabinet Netanyahu is building is dangerous," she added. The Jewish Home party released an official response Friday, thanking Ya'alon for his contributions to the State of Israel. "[Moshe] Ya'alon was a man of values who made a conscientious decision that restores honor to Israeli politics," it said in a statement. "We thank him for his contribution to the State of Israel at all stations in life, and are sure he will come back to public activities for the State of Israel." Defending the minister was Jewish Home MK Moti Yogev, who expressed support for Ya'alon despite the latter's history with Judea and Samaria (Shomron). "In one word: shame," Yogev said. "Defense Minister Moshe Ya'alon is an honest, professional and responsible man who was very active in strengthening the security of Israel, as well as strengthening the settlement movement." "I regret his resignation," he continued. "I have no doubt that Moshe Ya'alon will contribute much to the people and to the State of Israel." Justice Minister Ayelet Shaked was also sorry to see Ya'alon go. "Ya'alon is a principled man and a great contributor to the State of Israel," Shaked said. "His place should be in the government. I regret his decision to retire from political life." MK Bezalel Smotrich (Jewish Home) blamed the departure on Ya'alon's advisers, saying the "Achitophel of his office" caused Ya'alon's "vain and arrogant behavior" recently. "It's too bad," Smotrich said. "There was no one government minister recently who thought differently from him that hadn't bore the brunt of insulting epithets from him and his advisers." Shas chairman and Interior Minister Aryeh Deri called on Ya'alon to return to politics. "Moshe 'Buji' Ya'alon fulfilled the role of Defense Minister over the past several years with great success, dedication, and integrity," he said. "He is a man of principles who has dedicated decades of service to the security of Israel, and I call on him to take back his decision and continue to serve in the government." Coalition chairman MK David Bitan (Likud) agreed, calling the decision a "reckless move." "He was supposed to be appointed Foreign Minister, and he was able to bring his many skills to the State of Israel via the Foreign Ministry," he said, referring to conflicting reports that the offer may have been on the table; some reports claim this offer was never made. "Expanding the coalition is a matter of national interest, and for this purpose everyone needs to take national considerations into account over personal interest." "I hope with my entire being that Ya'alon reconsiders, and that on Monday he returns to action." MK Yoav Kish (Likud) concurred, saying he was "sorry" to hear Ya'alon would be quitting. "The Minister of Defense is a good man and a great minister, and no controversy can change that," he said. "His departure will be a loss for the Likud and the entire people of Israel." "I urge the Prime Minister to work things out and convince the Defense Minister to reconsider his decision," he added. But not everyone will miss the disgraced Defense Minister. MK Rachel Azaria (Kulanu) welcomed the resignation, adding she was eager to work with incumbent MK and Temple Mount rights activist Yehuda Glick. "[Glick] is a sharp and liberal man with interesting views that sometimes are surprising," Azaria said. "I am sure we will have the opportunity to work together." "I regret that Ya'alon did not understand politics: you can't always win," MK Oren Hazan (Likud) stated Friday. Hazan noted that he demanded Ya'alon be transferred to a different department since last year, citing Ya'alon's "weak security policy, repeated mistakes in conduct, and dangerous construction freeze." "In politics, you have to discover your nerves of steel, composure, and patience - and anyone who doesn't understand this will find himself thrown out."